The remaining news post I make for this release will likely contain one thing like this one does, since I'm running out of things I want to post. This is a unit available to both stealth and demo focuses, with a slightly different weapon for each. 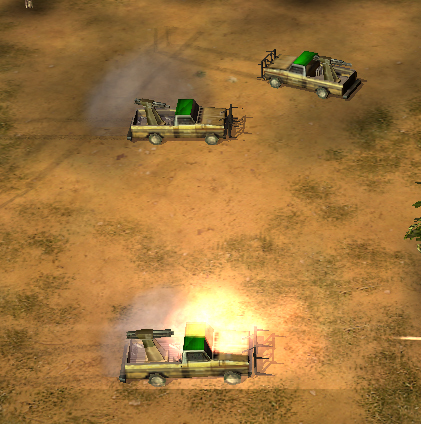 Stealth mounts this unit with a direct fire/indirect fire mortar that causes moderate damage but in a small area. When in direct fire mode teh weapon fires like a cannon, where as in indirect fire mode if fires like artillery. Mode must be switched manually. Demo's version of this unit is works the same way but with a different weapon. When in IF mode teh weapon bursts above teh target, breaking into four smaller projectiles that cause lighter damage than the stealth weapon but over a larger area. In DF mode the weapon doesn't break apart, resulting in higher damage than the IF weapon but over a smaller area. The stealth version of this unit replaces the Teir 0 tank, while the demo version replaces existing technical and tier 0 artillery. Stealth's version isn't a perfect tank replacement (since its not extremely effective against tanks) but works well as a support units to rpg infantry. However a group of mortar technicals can be effective against tanks. but one questing i have is the old technical in it, or is it replaced? Edited by phenom1989, 22 April 2009 - 03:40 PM. The mortar technical replaces the original technical for demo only. Stealth still has the original technical in addition to the mortar technical.